Shattered brings us back into the lives of the McKenna family with a bang! In Submerged we are introduced into the lives of Cole, Gage, Kayden, and Piper, the four siblings living in Yancy, Alaska. Their fifth sibling Reef, hasn't been around for the last few years. In Shattered, we are introduced to Reef, but only briefly before he is accused of murdering a fellow competitor in a circuit he is traveling with, and arrested. Shattered brings us into the some of the coldest months of the Alaskan winter. It's a couple of weeks away from Christmas, and the temperature is steadily getting colder. Yancy is at negative ten degrees. That isn't what sends a chill into the KcKenna family, it's the fact that another killer is out there and their brother is taking the fall for something he didn't do, at least that is how it appears to Piper. She can't believe that people would assume her brother would be guilty of this horrible act. Instead of letting the police take the lead, Piper sets off to try to find the real killer and learn more about the victim. As she Piper dives deeper into the life of the victim, Karli Davis, accidents start happening, her house is broken into, and the weird sensation that she is being watched starts to occur. With the help of Landon, Yancy's Deputy and a close family friend, they set off to learn what they can to help Reef. Piper isn't alone in the hunt, her family joins in and helps in their own research effort. They ask a reporter, Darcy St. James, to help look deeper into the story. And the mysterious Jake and his knowledge is back as well to help. Shattered takes you on a ride through Alaska, Canada, and California. Leaving you wondering, who the victim really was, and brings you into a mystery you never expected. All the characters are great. The McKenna's are a fun family to read about. Cole and Bailey are engaged and are celebrating. Piper is such a positive and out going person, it's hard not to like her and to read about her. We also get to dig a little deeper into Gage's background and learn more about his past. Jake is still a mystery. There hasn't been any indication to what his background is, but he is knowledgeable about so many things! I can't wait to read more about him. Kayden is not as outgoing as her sister, but the verbal jabs she throws at Jake are fun to read. There is one small question from the book that has left me wanting answers, will Sheriff Slidell be voted out? I hope that it is answered in Stranded. I wanted to hit him with a Crim 1 book over the head! His incompetence at a crime scene and his only aspiration to get reelected made me so annoyed. He showed no real enthusiasm for doing his job. Only sucking up to the mayor and making himself look good to the people, but sadly, that is real life as well. 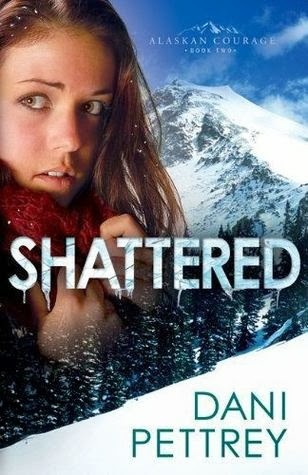 I really enjoyed the mystery of Shattered and the characters. It left me questioning, what is going to happen next? What are we not seeing?